Before joining the NTID faculty, Hurwitz worked as an electronics engineer and numerical-control programmer at McDonnell Douglas Corporation.When he arrived at NTID in 1970, he never imagined that someday he'd be leading the college. His initial ambition was to be a college professor. He taught math, electronics, and computer science, and provided support services to students majoring in Engineering and Computer Science. Steadily, he worked his way up—he was promoted to positions of increasing responsibility: Director for NTID Support Services, Associate Dean for Educational Support Services, Associate Vice President for NTID Outreach and External Affairs, Associate Dean for Student Affairs, Director of the Northeast Technical Assistance Center, and NTID Dean and Vice President. After NTID's director, Dr. Robert R. Davila, announced his retirement in 2003, a national search was conducted for a successor. 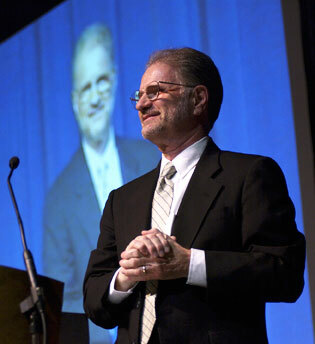 Dr. Hurwitz was appointed RIT Vice President and Dean/CEO for NTID. He's been actively involved in outreach efforts, meeting prospective students, alumni, parents, supporters, overseas institutions, and corporations. He's constantly striving to improve NTID and make it a model of excellence in curriculum and research, promoting a welcoming environment for a diverse student, staff, and faculty community, and helping NTID keep pace with the accelerated. ongoing changes in business and industry. Partnerships with foreign schools and programs have been established, benefiting deaf students in Asia-Pacific nations. He's active in several organizations (he was NAD President from 1982-1984), and serves on several boards, including Rochester School for the Deaf. He ad his wife Vicki, have two grown children, Bernard and Stephanie, and two grandchildren. His favorite hobbies are traveling, walking, reading, and spectator sports. He notes: "During this year’s National Association of the Deaf conference in New Orleans, I was pleasantly surprised by the number of people—friends and strangers—who approached me to tell me how well they thought of NTID and the direction it is heading. I am confident that NTID will continue to be a leader in education for students with hearing loss, and an integral resource for the Deaf community for decades to come."